As I mentioned, I received this book earlier this week. I kind of intimated that there were a couple of things bugging me about it. And there are. 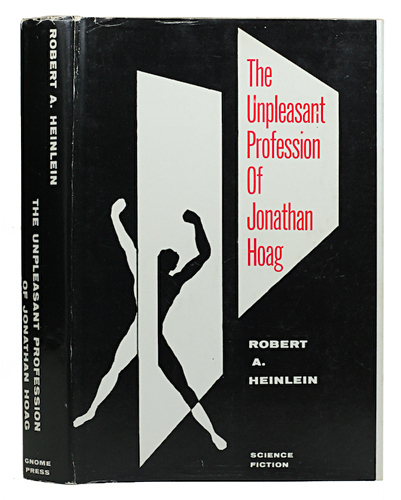 I guess I was unfair to introduce it as “The Unpleasant Impression of Jonathan Hoag” in that post. This is a Heinlein 1st edition and it is in great condition. That’s my layman’s description. In terms of grading I am not sure how to place this, my first impression was Fine, but I think perhaps the couple of issues I’ll highlight might send it down to Near Fine. Lets step through and check it out. All good so far, what a lovely clean cover. Beautiful. Well protected by a Brodart dust jacket cover too… But wait what’s that?? Lets have a closer inspection. Mr Bruce B. Tinkel has stamped his name nicely into the book. Well, at least he didn’t scrawl it in there with a magic marker or something. I’ll add this to the list of questions to remember to ask in an auction. OK, so if we look a little closer at the spine what do we see. Nice. Sits nice and square and the top and bottom of the spine look great. You can see the dust jacket is superb here, so often focal points for wear and tearing. I love the boards on this book, nicely embossed in three colours. Cool. The back of the dust jacket is nice and clean also. Between pages 18 and 19 the bottom edges are still attached to each other!! Either the trimming process was a little inaccurate or more likely the binding process was. Now, I don’t know about you, but I think it would certainly be a major inconvenience to read this book and maintain this situation. Especially over a 50 year period. You can also see the text block is darkened as is typical for the later GP books. Actually, after consideration I wasn’t too concerned about the price-clipping. As far as I know, Gnome never released a BCE edition of this book. I’m pretty sure the Gnome Press book club (called the Fantasy Book Club) was dead by the time this book was published. I’ve been in regular contact lately with Jean whom I bought this off – there are a couple more Gnome Press books winging my way. Many thanks Jean, I certainly appreciate this Heinlein, it’s the star of my collection thus far. Binding: Tan-olive cloth with three-color title embossing. GP Edition Notes: 1st edition so stated on the copyright page. Comments: Great shape. I think this would be Fine if not for the flaws I’ve highlighted. I would appreciate input from anyone who might advise me otherwise or have any comments about this book. This entry was posted on February 5, 2009 at 8:33 pm and is filed under 1959, Close Up with tags Robert Heinlein, The Unpleasant Profession of Jonathan Hoag, W.I Van der Poel. You can follow any responses to this entry through the RSS 2.0 feed. You can leave a response, or trackback from your own site.